Ever since last summer, I've been smitten with naturally colorful food. It started with purple cauliflower, orange cauliflower, and purple potatoes. This transitioned to organic red kale and most recently blood oranges. After staining my fingers a teensy bit with the oranges I figured I might as well go all out with the red theme and try my hand at cooking beets! After all, I've adored blueberries for years and regularly have purple-stained fingers from assembling my morning oatmeal or yogurt. Obviously, I have no problem getting my hands dirty. I have to admit that color isn't the only thing drawing me to these foods, although it's a perk. More than anything, it's the phytonutrients (like flavonoids and carotenoids), plus vitamins and antioxidants. I'm on a personal journey to try new foods (especially vegetables) that span a spectrum of colors. It's actually quite fun experimenting with foods you've never eaten (and a sneaky way to trick picky eaters into trying healthy foods). And before I rush into the recipe, let me briefly describe beets. After all, this post will likely draw some folks who, just like me (at least until now), have never eaten or cooked beets at home. 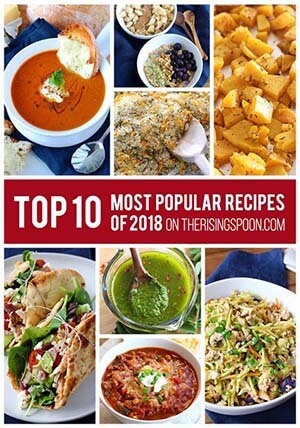 When I looked up various techniques and recipes for cooking them, most described the flavor as "earthy". As someone who does not care for mushrooms, this term left me expecting a similar taste or texture. This was not the case. I'm still struggling to put a quick description to it, but beets have a flavor (not texture) that's subtly dense and more reminiscent of a potato's "earthiness" than a mushroom. And having read multiple articles that recommend pairing it with brown sugar and orange juice (flavors that pair well with sweet potatoes), this seems to further support my comparison. Still, I opted to simply roast them for my first time, as I wanted an honest beet-only taste. I'm sure the sprinkling of fleur de sel didn't hurt either. Fresh beets are washed, seasoned and roasted to intensify their mild, earthy flavor then sliced and sprinkled with fleur de sel. 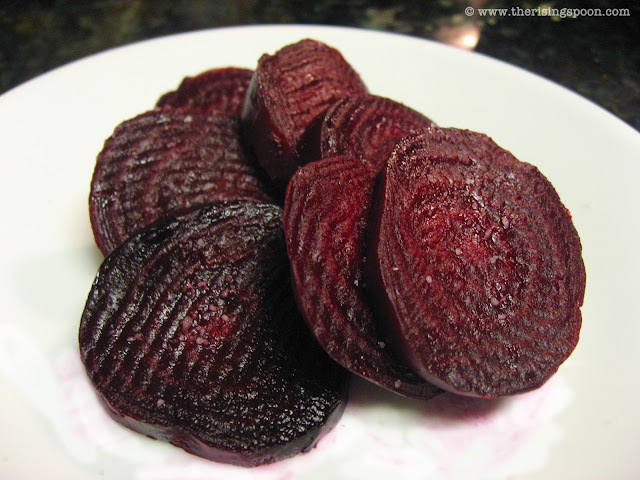 Roasted beets make a great appetizer, snack, side dish or salad topper. They're also an excellent, low-calorie source of vitamins, minerals, antioxidants, and phytonutrients. Pre-heat the oven to 425 degrees. 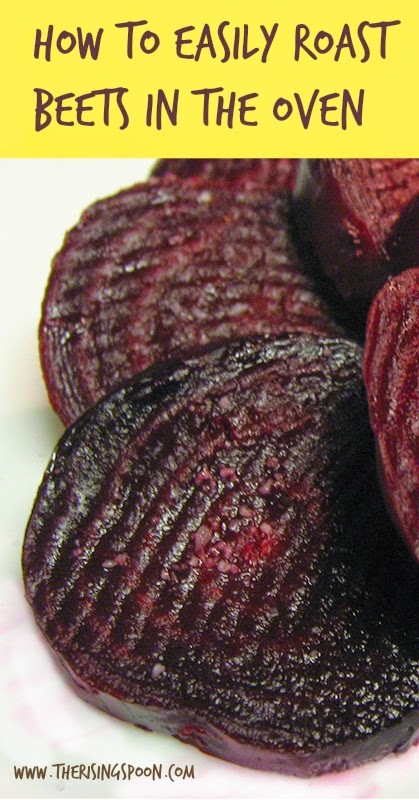 If using fresh beets with stems and greens attached, chop these off and save the greens for sautéing, soup or salads. If there are long, thin tips attached to the beet root, you can either cut those off or leave them be. Set out a large cookie sheet and tear off three small pieces of foil. Wash the beets thoroughly under running water to remove all dirt, then dry with a paper towel (using a dish towel may stain it) and place each beet on a separate piece of foil. When cooked through, remove the beets from the foil and let cool for 5 to 10 minutes. Then rinse each beet under cool, running water and gently apply pressure, in a rubbing motion, to remove the skin. Once the skin is removed, carefully transfer to a plate (avoid dripping on things) and slice into rounds of your desired thickness. Sprinkle with fleur de sel, or your favorite sea salt, to taste. Fleur de sel, translated as "flower of salt", is a coarse French sea salt. If you don't have access to it, simply substitute your favorite sea salt. It's possible to cut the cooking time in half if you peel and dice the beets into chunks, but I find it easier to simply roast then remove the peel afterward. Question for Discussion: What's your favorite way to prepare beets?